When it comes to securing the enterprise, CIOs certainly have their hands full. Whether it’s implementing new services, managing cloud computing and BYOD initiatives, tackling long-standing challenges like data protection, or protecting networks and applications against attacks, there’s plenty going on to keep a CIO awake at night. However, the danger here is that when something like cloud computing or BYOD comes along and grabs the headlines, resources are directed away from serious security efforts, which puts the business in far more peril. There’s a lot of investment – from both security companies and businesses – into securing the enterprise from threats targeting those emerging areas mentioned above. But research has shown that it’s existing threats that are the root cause of security nightmares for CIOs. Nearly half (44%) of all breaches recorded in 2014 came via vulnerabilities that were between two and four years old. Every one of the top ten vulnerabilities exploited in 2014 took advantage of code written years, or even decades ago, according to research by HP. Known bugs or logic flaws were the primary causes of commonly exploited software vulnerabilities, while server misconfigurations played an important role as well. This leads to one of the top security priorities for CIOs: updating infrastructure quickly. The previously mentioned research shows that IT departments can neutralise up to 95% of attacks if they make updating their software a priority; updates should be applied as soon as they are available – ideally within two weeks. For many, that generally means waiting for the second Tuesday of every month when the Microsoft Patch Tuesday rolls around. This is when Microsoft, Adobe and Oracle traditionally release updates and patches for whatever software vulnerabilities they’ve found and fixed. With the new Windows 10, Microsoft is introducing technology that will further streamline the system of pushing out updates as quickly as possible, moving towards an approach that has become common already in the consumer world. We all know the almost daily cycle of updates we go through with the apps on our mobile devices, while Google Chrome users are already used to continuous updates installing in the background. This style of fast and automatic update is a great way for businesses to ensure their software is as resilient to attacks as it can possibly be. Automating the update and patching process is a well tested approach to security and well accepted by end-users. However, the IT team has to be confident in the vendors that are supplying updates to them, and be confident that implementing updates won’t upset existing applications or services. A second priority for CIOs at the moment is one that requires a bit of involvement from the end-user – but it’s one that can make a massive difference to the security of an organisation. It’s to do with improving management of credentials. This is another area where the enterprise can learn from the consumer space. How many of us have to use some form of two-factor authentication (2FA) when we log into our online banking service? How about email or social media accounts? Having something as simple as a one-time code sent to your mobile device to enable log-on dramatically increases how secure an account is. Stolen credentials are regularly used in hacking attacks. A recent breach of the German parliament network was enabled by the hackers gaining “administrator rights”, which essentially gave them unrestricted access across the computer network. It’s currently not known what information was accessed or who was responsible – from criminal gangs through to state-sponsored attackers – but fingers have been pointed in Russia’s direction. Adding that second layer of protection, via 2FA or one-off tokens, won’t make an enterprise totally secure but it will solve a lot of these problems. These days, there really is no excuse for not using 2FA wherever it’s available – long ago, the cost ruled out all but the biggest, most security-conscious companies but that’s no longer the case. In fact, in most instances, adding 2FA support is free. Adding 2FA is particularly simple for businesses that develop their own software and services in-house. And, this takes us on to our third CIO security priority: securing the development process. More and more businesses are developing their own software, believing that this approach offers the best way to ensure their requirements are met in the most cost-effective manner. However, if the software development and programming are done internally, they need to be done in a secure way. This emphasis on security is important as it helps the business reduce risk and cut the need to re-work the software at a later date; if and when a vulnerability or other issue is discovered. As pointed out before, the majority of cyber attacks are launched through a vulnerability in an unpatched program, so removing those vulnerabilities reduces that attack vector cyber criminals can use. There are plenty of courses available that teach developers specific skills that help with building more secure applications or services. If a CIO is going to prioritise developing in a safe and secure way then it may be worth investing in a course for their developers. These three priorities are simple but incredibly effective ways of making the IT environment – and of course the business as a whole – more secure, and will make a huge difference to the organisation. Things such as automatic updates and enabling 2FA where available are simple to deploy. It’s really not that hard to be a bit more secure. Hiring Rockstar’s & Exploring Innovative Minds !! At BrightStar you will learn, innovate and get freedom to do your work in a way that suits you. With lots of responsibilities accordingly and opportunities for personal- and professional development. Join Our Journey – You have a few years of experience under your belt in Oracle EBS or Oracle Fusion Apps or Oracle Database, and are at crossroads. You know what your career has been missing, and you would like to address it. You are motivated to do something different; something better. If you are a Oracle FIN/ SCM/ WMS/ EAM/ MANUFACTURING/ FUSION/ BI/ PRIMAVERA professional who lived off the shores for a while and would like to return home – we have terrific opportunities for you. Opportunities span Development (Individual / Lead Roles), Solution Consulting, Sales, Service Delivery, Program Management, PreSales and more. 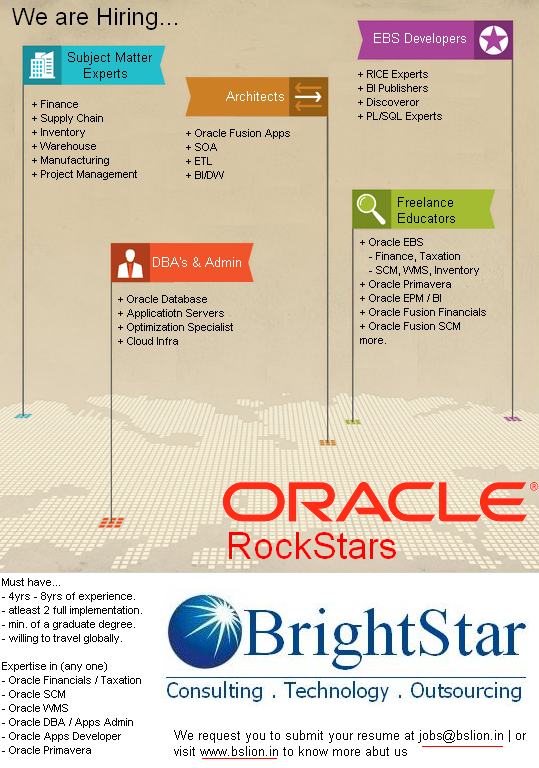 In fact all specializations in Oracle Enterprise Application & Analytics are welcome. Email us today at jobs@bslion.in or visit our business page at http://www.bslion.in to know more about us. Remember, don’t forget to tell us about your interests and accomplishments too without being too modest: we want to see you shine! Please also include links to previous work and any online presences, such as LinkedIn, Facebook, Google+, or your blog. Does Inventory Management Solution in the Cloud makes sense! Inventory management is about knowing what products to have on hand and when to have them on hand. It’s about understanding what you have in your warehouse and where your stock is located. It means maintaining optimal inventory levels that avoid unnecessary capital expenditures, while ensuring you can meet demand and not run out of goods. Traditional on-premise ERP systems and less sophisticated systems like QuickBooks typically lack the real-time visibility required to effectively manage inventory in today’s modern distributors. Many companies resort to unwieldy spreadsheets to manage inventory or rely on gut feel, potentially costing thousands of dollars in emergency replenishment or lost revenue from stock-outs. Cloud-based inventory management offers a compelling alternative to manual approaches to inventory management or costly on-premise ERP. The best cloud system provides real-time visibility into inventory, with anywhere, anytime access to critical information. It can function at the core of an ERP system, integrating seamlessly with demand planning, financials and logistics. Automated capabilities eliminate manual inputs while maximizing efficiency throughout the inventory lifecycle. A cloud-based inventory management system built with flexibility in mind allows you to define your business processes into the system. It offers flexibility for you to implement customizations and business rules that support your unique requirements. The optimal cloud architecture preserves these customizations for you, so that they remain intact even as the cloud provider periodically upgrades your system to the latest release. In the cloud, you can have real-time visibility into your warehouses and other inventory locations, either domestically or internationally. If you have an international presence, the right multi-subsidiary management system gives you both global visibility and localized control, so that inventory can be managed centrally or managed by location. This type of visibility will help influence purchasing requirements versus transfer requirements. Unlike spreadsheets or desktop applications, the cloud doesn’t tether you to a desk. Web-based inventory management gives your personnel anywhere, anytime access to real-time data, whether on the road with a mobile device or receiving alerts on the warehouse floor. Metrics-driven dashboards let your managers continuously monitor and improve performance. Authorization of Purchase Request/ Purchase Requisition : If the purchasing value of the PR is higher than that of approval limit of originator then this document is sent to the next higher level (normally immediate supervisor of the originator) for approval. At this stage, the supervisor may return the PR to the originator for modification or can approve it. Procurement: After final authorization of PR, it is available to Buyer. Buyer shall check for any existing Annual Rate Contract or any other contract for the material. If any contract exists then a Call-Off shall be generated and shall be sent to the supplier. In case no contract exists then the Buyer shall initiate supplier search and floating inquiries. Floating of Inquiries: Once the suppliers are identified, Buyer shall send the Request For Quotations/Proposal ( RFQ/RFP) to the supplies. RFQ normally contains Description, Technical Specifications of the material, quantity of the material, term and conditions, delivery date of the material, date of submission of the RFQ,Quality standards, Validity of the suppliers offer, etc. Selection of the Vendor: After negotiations with all the selected vendors revised quotations are prepared and vendor is finalized for award of contract based on the weight-age to the commercial, technical parameters, previous performance of the vendor, delivery dates of the material, etc. If the buying organization is using ERP then stock account gets debited and liability account gets credited. How will you use Oracle Cloud Computing? This group wants cloud for modern, personalized applications. In the digital economy, companies must execute in real-time, from providing customer experiences to building talent-centric HCM strategies. Your customers want to seamlessly interact with their brand, wherever and whenever they want on social media, mobile, in-store, through the call center, on your website, and when making a purchase online. Speed, integrated processes, and analytics are vital. For these people, cloud often means SaaS-based applications that are fast, simple, and give the business side more control. IT Leaders – IT also sees enormous value in the cloud, particularly in the application and platform services that let internal IT groups offload technology management. CIOs cannot forget existing infrastructure requirements when they evaluate cloud computing, and cloud services such as PaaS and IaaS can help them integrate applications and create consistent workflows across multiple systems—both on premises and in the cloud—while maintaining security and performance. As a result, IT can move away from technology administration and concentrate on business innovation. Cloud Builders – Private cloud deployment is booming, as companies see the benefits of faster provisioning, on demand access, and scalability. Cloud builders can help their IT department become agile, cost-efficient private cloud providers. They view cloud from a lifecycle management perspective, from resource management and monitoring to capacity planning and chargeback mechanisms. Developers – For this group, moving development and testing environments to PaaS platforms allows them to cut significant time from the development cycle by removing management tasks, cutting complexity, and increasing developer productivity. Total Cloud – The key then is to build a cloud strategy that helps every group define not only what cloud computing means to them, but also how to best use it. The best use might be to build a cloud behind your firewall. Or it could be to subscribe to cloud applications and compute services from a trusted cloud vendor. Another option is to use infrastructure or application that is dedicated to your organization but hosted by a vendor or a local partner. Most likely, you’ll be using several of the above of the above scenarios at once. So it makes sense to choose a cloud provider with solutions that are pre-integrated and tested to work across the entire stack, whether in your data center or in the cloud. That way, even though cloud computing means different things to different people, you will have a single, complete, and integrated platform to serve them all. Healthcare has become one of India’s largest sectors – both in terms of revenue and employment. The industry comprises hospitals, medical devices, clinical trials, outsourcing, telemedicine, medical tourism, health insurance and medical equipment. The Indian healthcare industry is growing at a tremendous pace due to its strengthening coverage, services and increasing expenditure by public as well private players. The Indian healthcare delivery system is categorised into two major components – public and private. The Government, i.e. public healthcare system comprises limited secondary and tertiary care institutions in key cities and focuses on providing basic healthcare facilities in the form of primary healthcare centers (PHCs) in rural areas. The private sector provides majority of secondary, tertiary and quaternary care institutions with a major concentration in metros, tier I and tier II cities. India’s primary competitive advantage lies in its large pool of well-trained medical professionals. Also, India’s cost advantage compared to peers in Asia and Western countries is significant – cost of surgery in India is one-tenth of that in the US or Western Europe. According to estimates, the overall Indian health care market today is US$ 65 billion, of which the hospital supplies and health care equipment segment is believed to be only around US$ 4.5-5 million. Health care delivery, which includes hospitals, nursing homes and diagnostics centres, and pharmaceuticals, constitutes 65 per cent of the overall market. India requires 600,000 to 700,000 additional beds over the next five to six years, which potentially throws an opportunity of more than US$ 25-30 billion. While the existing hospitals would look at expanding their capabilities, a lot of new properties would also come up. Overall the number of transactions in the healthcare space is going to grow as companies are seeking growth capital. The average investment size by private equity funds in healthcare chains has increased to US$ 20-30 million which was around US$ 5-15 million, said Mr Abhishek P Singh, Associate Director for Healthcare, PricewaterhouseCoopers (PwC). The Indian medical tourism industry is pegged at US$ 1 billion per annum, growing at around 18 per cent and is expected to touch US$ 2 billion by 2015. There is a significant scope for enhancing healthcare services considering that healthcare spending as a percentage of GDP is rising. Rural India, which accounts for over 70 per cent of the population, is set to emerge as a potential demand source. Only three per cent of specialist physicians cater to rural demand. The hospital and diagnostic centres attracted foreign direct investment (FDI) worth US$ 2,793.72 million between April 2000 and January 2015, according to data released by the Department of Industrial Policy and Promotion (DIPP). Mylan Inc has signed a deal to acquire the female health care businesses of Famy Care Ltd, a specialty women’s health care company, for US$ 750 million in cash and additional contingent payments of up to US$ 50 million. Sanofi-Synthelabo (India) Ltd had invested Rs 90 crore (US$ 14.47 million) in Apollo Sugar Clinics Ltd (ASCL), a unit of its subsidiary Apollo Health and Lifestyle Ltd.
Apollo Hospitals Enterprise (AHEL) plans to add another 2,000 beds over the next two financial years, at a cost of around Rs 1,500 crore (US$ 241.24 million), as per Mr Prathap C Reddy, Founder and Executive Chairman, Apollo Hospitals. Temasek Holdings Pte Ltd has acquired the entire 17.74 per cent stake of Punj Lloyd Ltd in Global Health Pvt Ltd, which owns and operates the Medanta super specialty hospital in Gurgaon, Haryana. CDC, the UK’s development finance institution, has invested US$ 48 million in Narayana Hrudayalaya hospitals, a multi-speciality healthcare provider. With this investment, Narayana Health will expand affordable treatment in eastern, central and western India. Apollo Health and Lifestyle Ltd (AHLL), a wholly-owned subsidiary of Apollo Hospitals Enterprise, has acquired Nova Specialty Hospitals at an estimated cost of Rs 135-145 crore (US$ 21.71-22.32 million). India’s universal health plan that aims to offer guaranteed benefits to a sixth of the world’s population will cost an estimated Rs 1.6 trillion (US$ 25.73 billion) over the next four years. The Competition Commission of India (CCI) in its meeting has approved the proposed merger between Sun Pharma and Ranbaxy, subject to the parties inter alia carrying out the divestiture of their products relating to seven relevant markets for formulations. India and Sweden celebrated five years of memorandum of understanding (MoU). The cooperation in healthcare between India and Sweden will help in filling gaps in research and innovative technology to aid provisioning of quality healthcare. Generic drug maker Mylan Inc and the US-based Abbott Industries have received the CCI’s nod to proceed with their merger. Mr J P Nadda, Union Minister for Health & Family Welfare, Government of India has launched the National Deworming initiative aimed to protect more than 24 crore children in the ages of 1-19 years from intestinal worms, on the eve of the National Deworming Day. Under the National Health Assurance Mission, Prime Minister Mr Narendra Modi’s government would provide all citizens with free drugs and diagnostic treatment, as well as insurance cover to treat serious ailments. All the government hospitals in Andhra Pradesh would get a facelift with a cost of Rs 45 crore (US$ 7.23 million), besides the establishment of 1,000 generic medical shops across the State in the next few months. India is a land full of opportunities for players in the medical devices industry. The country has also become one of the leading destinations for high-end diagnostic services with tremendous capital investment for advanced diagnostic facilities, thus catering to a greater proportion of population. Besides, Indian medical service consumers have become more conscious towards their healthcare upkeep. Telemedicine is a fast emerging sector in India. In 2012, the telemedicine market in India was valued at US$ 7.5 million, and is expected to grow at a CAGR of 20 per cent to US$ 18.7 million by 2017. India’s competitive advantage also lies in the increased success rate of Indian companies in getting Abbreviated New Drug Application (ANDA) approvals. India also offers vast opportunities in R&D as well as medical tourism. There are vast opportunities for investment in healthcare infrastructure in both urban and rural India. About 1.8 million beds are required by the end of 2025. Additionally, 1.54 million doctors and 2.4 million nurses are required to meet the growing demand. 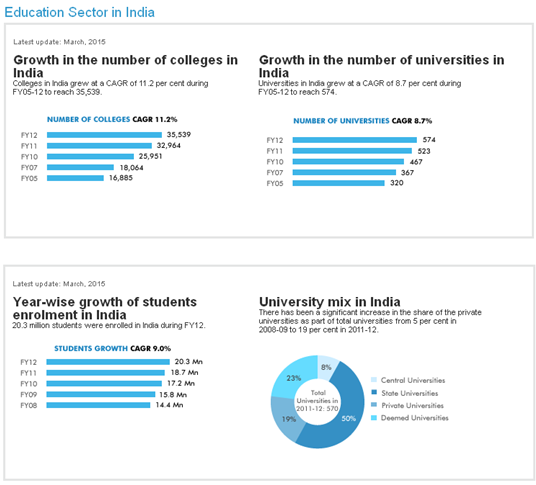 EMC Corporation plans to establish 100 centers of academic excellence in India in 2015. These centers will be set up in leading IT institutes across the country to give students an opportunity to learn and practice key skills in the areas of cloud, data science, analytics, IT infrastructure and other leading technologies, as per a company statement.